My new home has lavender and thyme in the front flowerbeds. They've not been pruned (in 3-4 years). The lavender is 2. 5 feet high with 1/2-inch woody stems. 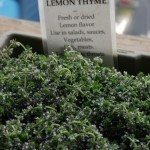 The thyme looks like underbrush, wirey and dead about 4 inches deep.